Day 90. The day began with a wait. No, the wait began much earlier. Maybe a few weeks ago. A wait of several years that had finally come down to days and then hours. The preparations had begun too. But preparations of a different kind. No shopping for gifts. A voucher arranged for instead. No shopping for groceries or handing over a list of what fish or meat to buy. All that had been replaced by repeated reviews of the menus of various restaurants on the mobile. As the Dday dawned, there was none of the rush to wake up early and head for the kitchen. No aroma of the dal being seasoned, no rhythm of the vegetables being chopped, no quick glances at the recipe book, no checking of the seasoning or tasting to see if the meat was tender enough. The air was strangely odourless. Strangely quiet. The quiet only broken by reminder calls to the restaurant. The food had been arranged for. It would reach on time, I was assured. It was now time to prepare for the ritual itself. The thali was ready. Kajal, ghee, dahi and chandan in place along with the dhaan-durba. The lamp stood there, oiled and ready to be lit. It was all perfect. Yet, something seemed amiss. My hands didn’t smell of the chandan that had been made into a fine paste or the mustard oil that had poured into the lamp and its wick soaked. No scent, neither sweet like sandalwood, nor pungent like mustard oil. As evening fell, and the time drew near, I took out the sari and the accessories that I had kept ready from the night before and dressed up. Ready, I waited for the doorbell to ring. And missing the sounds and scents I associate Bhaiphota with. And then they arrived. My two brothers. And suddenly the air felt lighter, fragrant even. Fragrant with love, the only other thing that can be more appetising than the aroma of a delicious homecooked meal. As I put photas on their foreheads, and said the mantra in my mind, praying for their well-being, I also said a silent note of thanks. For, the wait had ended. The wait to see that shiny mark on my brother’s forehead before the sandalwood paste turns dry and cakey. Yes, the wait had ended. Not perhaps in the manner I would have liked it to end. Not with the scent of spices filling up my senses. Not with all my brothers around me. But there’s hope yet. If this wait has ended, the others will come too. Some day. Till then, my heart is filled with gratitude and joy and a little bit of greed. 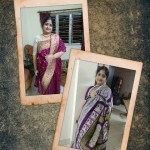 The sari is a south cotton from Nalli, a Puja gift from a sister-in-law. 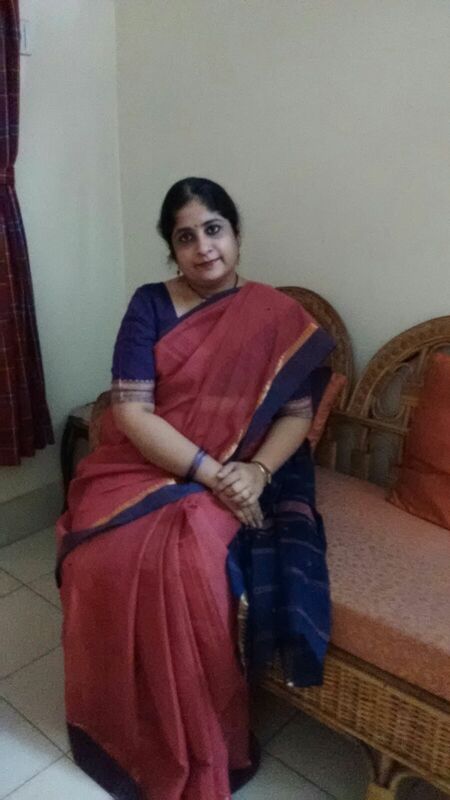 The blouse is yet to be stitched but another one from an old sari seemed a perfect match. Neckpiece and earrings from Fab.